Stalled construction sites are a dime a dozen in New York City, but not all of these half-built lots are ugly eyesores. Tucked away on a site in the Alexandria Center for Life Science, between First Avenue and the East River on 29th Street, sits Riverpark Farm. 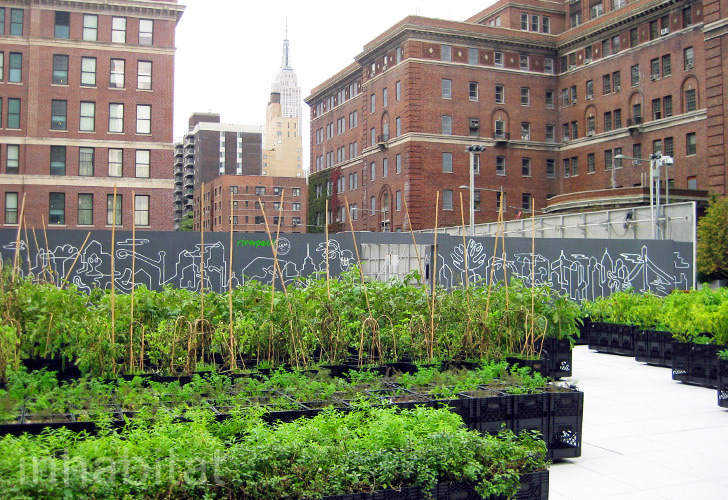 Arguably the Big Apple's "most urban farm," the lush food producing plot was built this past spring by ORE Design & Technology for Riverpark, the Tom Colicchio restaurant on site. Given our love for urban farming and sustainable food, we were thrilled when ORE recently invited us to tour the farm -- click through for an inside look! The 15,000 square foot Riverpark Farm is made from stacked black milk crates lined with landscaping fabric, meaning that the entire thing can be picked up an moved (which they had to do during Hurricane Irene). Because building on the stalled site could resume at any time, the farm needed to be portable. Thomas Kosbau, founder of ORE Design, decided on milk crates because they’re sturdy, stackable, and each can be carried by one person. The fabric liners were specially sewn by a local seamstress, and each can be used for up to 15 years. The crates filled with plants are set on upside down crates, which, coupled with the breathable fabric, allows for optimal aeration and drainage. Riverpark partnered with GrowNYC to help manage the farm, and farmer Zach Pickens notes the many benefits to working with movable planters. Depending on how the plants are growing, the crates can be rotated to get the best sunlight, and they can be raised and lowered. The crates can also be easily rearrange to look nice, with the prettiest plants at the front of the farm, seen by visitors to the Alexandria Center and Riverpark’s Farm Table, a small open air dining room situated in the middle of the farm’s 6,000 plants. The farm’s first growing season has been hugely successful, with Riverpark and its sister sandwich shop, ‘wichcraft, getting an abundance of produce straight from the farm. Chrissa Yee, project manager at Riverpark, says the percentage of produce that the restaurant gets from the farm changes day to day, but during the summer there were 20 or so vegetables and herbs from the farm on the menu. The farm was able to provide Riverpark with all of its eggplant, and, thanks to the urban heat island effect, they had a lot of success growing okra, a vegetable usually grown in the south. With the first frost right around the corner, Riverpark Farm is preparing for the colder weather. Low covers, like mini greenhouses, will be built over most of the beds to keep the plants growing for as long as possible, and even the raised milk crate beds will lengthen Riverpark’s growing season because the sun warms the soil more quickly, making it take longer to freeze. Even though the farm is located on the stalled site of the Alexandria Center‘s west tower, it will not be dismantled when building resumes. “We’ve become very attached to the farm,” says Yee. Instead, the farm will simply move to a new location on the center’s 1.1 million square foot campus. Given the success that Riverpark has found through building its own farm, we hope that other businesses and restaurants follow suit. There are over 600 stalled construction sites in New York City, why can’t more of them produce our food? How do you cut the fabric for the milk crates. We first saw this on the Cooking Channel/Extra Virgin and want to try, but I believe there was a special way to cut the fabric. The 15,000 square foot Riverpark Farm is made from stacked black milk crates lined with landscaping fabric, meaning that the entire thing can be picked up an moved (which they had to do during Hurricane Irene). Because building on the stalled site could resume at any time, the farm needed to be portable. Thomas Kosbau, founder of ORE Design, decided on milk crates because they're sturdy, stackable, and each can be carried by one person. The fabric liners were specially sewn by a local seamstress, and each can be used for up to 15 years. The crates filled with plants are set on upside down crates, which, coupled with the breathable fabric, allows for optimal aeration and drainage. Riverpark Farm was built in just a few short months (another reason why ORE opted to use milk crates), and it has been growing more than 6,000 plants for the restaurant. The steel frame work for the stalled tower juts up throughout the farm. Electricity for the lights below the planters is pulled from the below-ground parking garage under the center. The farm's first growing season has been hugely successful, with Riverpark and its sister sandwich shop, 'wichcraft, getting an abundance of produce straight from the farm. Chrissa Yee, project manager at Riverpark, says it's hard to gauge exactly what percentage of its produce the restaurant gets from the farm because it varies so much on a day to day basis. Here, Yee pulls a baby carrot straight from the ground. The farm had a huge eggplant harvest and was able to provide Riverpark with all of the eggplant it needed. Thanks to the urban heat island effect, the farm also had a lot of success growing okra, a vegetable usually grown in the south. With the first frost right around the corner, Riverpark Farm is preparing for the colder weather. Low covers, like mini greenhouses, will be built over most of the beds to keep the plants growing for as long as possible. On plants that are reaching their end, cover crops of grasses have been planted in the soil to keep it healthy for more plantings. Riverpark partnered with GrowNYC to help manage the farm, and farmer Zach Pickens notes the many benefits to working with movable planters. Depending on how the plants are growing, the crates can be rotated to get the best sunlight, and they can be raised and lowered. The crates can also be easily rearrange to look nice, with the prettiest plants at the front of the farm, seen by visitors to the Alexandria Center and Riverpark's Farm Table, a small open air dining room situated in the middle of the farm's 6,000 plants. Even though the farm is located on the stalled site of the Alexandria Center's west tower, it will not be dismantled when building resumes. "We've become very attached to the farm," says Yee. Instead, the farm will simply move to a new location on the center's 1.1 million square foot campus. Only the lush, plentiful part of the farm is visible to the public. The behind-the-scenes dirty work is kept in the back, behind a black construction fence. Given the success that Riverpark has found through building its own farm, we hope that other businesses and restaurants follow suit.